Episode #71: Superman In Exile Part I! 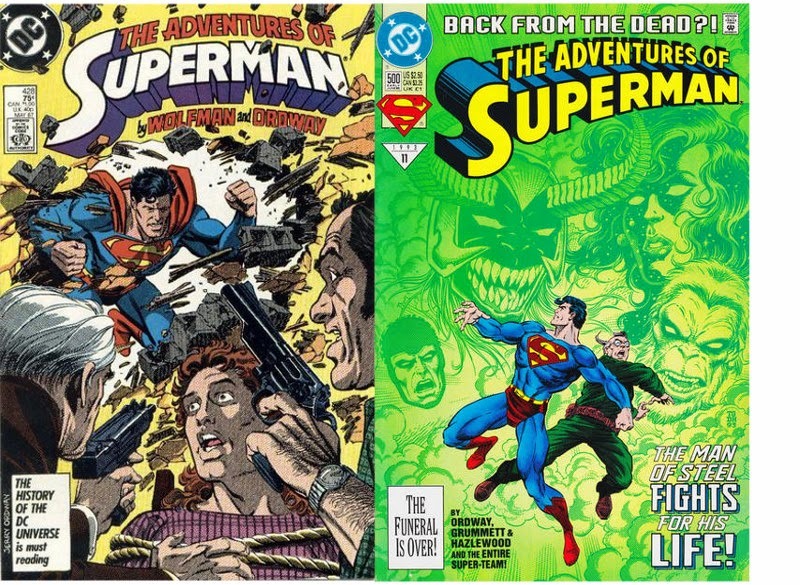 The first two issues of the SUPERMAN IN EXILE story: SUPERMAN 28 & THE ADVENTURES OF SUPERMAN 451! This episode begins our look at the 15 issue SUPERMAN IN EXILE story from the Superman titles in 1989. They were collected in the SUPERMAN: EXILE trade paperback still in print. For a complete list of the SUPERMAN IN EXILE stories go to blog entry titled SUPERMAN FAN PODCAST SPECIAL BLOG: SUPERMAN IN EXILE CHECKLIST! found at http://supermanfanpodcast.blogspot.com/2009/04/superman-fan-podcast-special-blog.html . ACTION GAMES & COMICS at 782 W. Montrose St., Clermont, FL. Their myspace page is http://www.myspace.com/actiongamesandcomics . ACME COMICS & COLLECTIBLES at 905 E. State Road 434, Longwood, FL. Their website is http://acme-superstore.com . 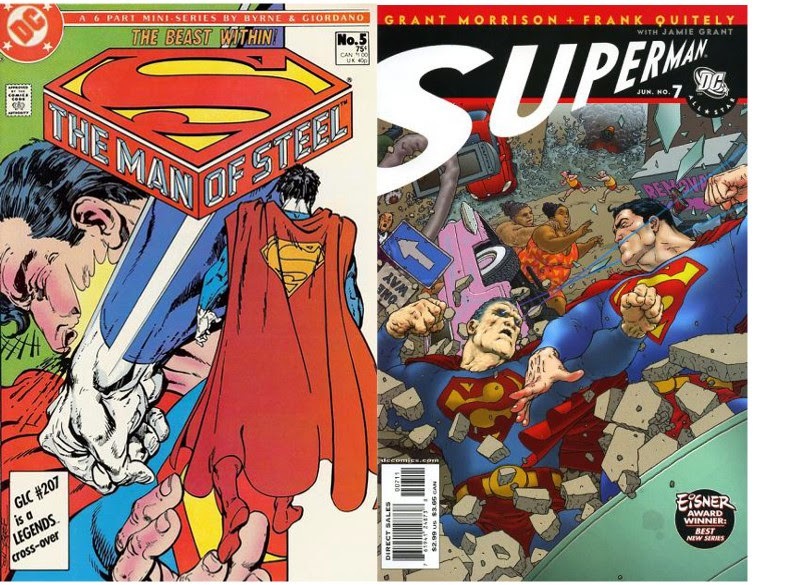 Finally I share my opinions on the state of Superman comics in 2009, and how Superman fans of the movies and TV shows can get into comics, both the Superman titles in particular and comics in general. MY PULL LIST is my spoiler free comic book review blog on the titles I read every week. It can be found at http://mypulllist.blogspot.com . Send e-mail about this blog to mypulllist@gmail.com . 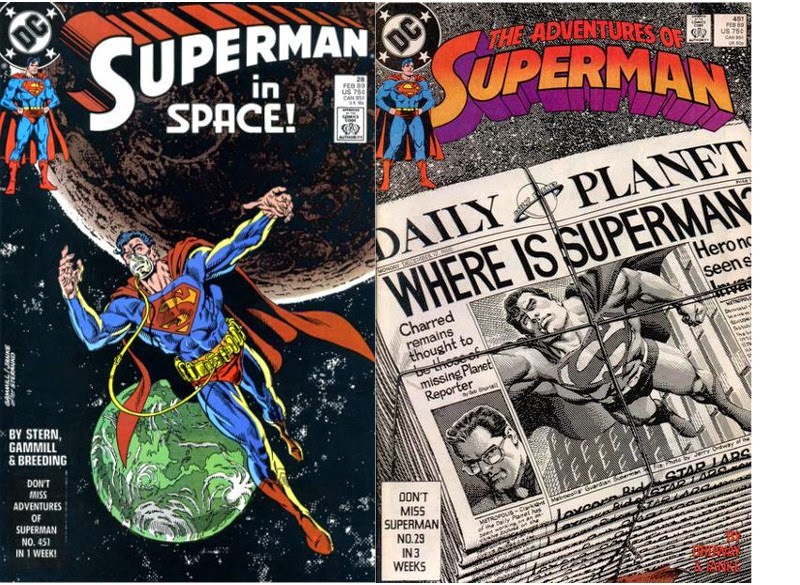 The covers for SUPERMAN #28 and THE ADVENTURES OF SUPERMAN 451 which serve as art for this episode were used for educational purposes within the "fair use" provision of the U. S. Code: Title 17, Sec. 107. Superman and all related characters are trademark and copyright DC Comics. Episode #70: Happy Birthday, Mort Weisinger! Mort Weisinger was born on April 25, 1915, which this year in 2009 is on a Saturday. He died on May 7, 1978, about a month before I graduated from high school. MAN OF TWO WORLDS: MY LIFE IN SCIENCE FICTION AND COMICS by Julius Schwartz with Brian M. Thomsen, published by Harper Collins in 2000. This book, by Mort's life long best friend, is currently out of print, but can be found at various on line vendors. I found my copy through a vendor selling through Amazon.com. MEN OF TOMORROW: GEEKS, GANGSTERS AND THE BIRTH OF THE COMIC BOOK by Gerard Jones, published by Basic Books in 2004. SUPERMAN: THE COMPLETE HISTORY by Les Daniels, published by Chronicle Books in 1998. CURT SWAN: A LIFE IN COMICS by Eddy Zeno, published by Vanguard Productions in 2002. Next episode: SUPERMAN IN EXILE, Part I! Expanded show notes can be found at http://supermanfanpodcast.blogspot.com. Send e-mail to supermanfanpodcast@gmail.com . The theme music for this podcast is PLANS IN MOTION composed by Kevin MacLeod, part of the royalty free music library found at http://incompetech.com/ . Episode #69: Superman Goes Gangbusters! Jose Delgado first appeared in THE ADVENTURES OF SUPERMAN 428, and made his final appearance in his original run in THE ADVENTURES OF SUPERMAN 500! This episode is the second and final prequel to our upcoming look at the SUPERMAN IN EXILE storyline from the early 1990's. The first prequel episode was #66: SUPERMAN IN THE POCKET UNIVERSE! Thanks to the web site http://comics.org. I was able to do a search for Jose Delgado and find a listing of all of his comic book appearances. It was a valuable aid in going through my collection of Superman comic books to prepare the show notes for this episode. Not all of these stories have been reprinted, so if you would like to find some or all of the stories Jose Delgado/Gangbuster appeared in, go to http://www.comics.org/character/name/jose%20delgado/sort/chrono/ . The Gangbuster referred to in the title was the super hero identity of Jose Delgado, who had no super powers but was athletic and an experienced boxer. He appeared in many stories in the various Superman titles beginning with ADVENTURES OF SUPERMAN #428, the May 1987 issue, through ADVENTURES OF SUPERMAN #500, the June 1993 issue. How the Pocket Universe and Gangbuster leads into the Superman In Exile story will be explained in this episode. Next episode: It's birthday wishes for Mort Weisinger! The podcast theme music is PLANS IN MOTION composed by Kevin MacLeod, part of the royalty free music library of http://incompetech.com . 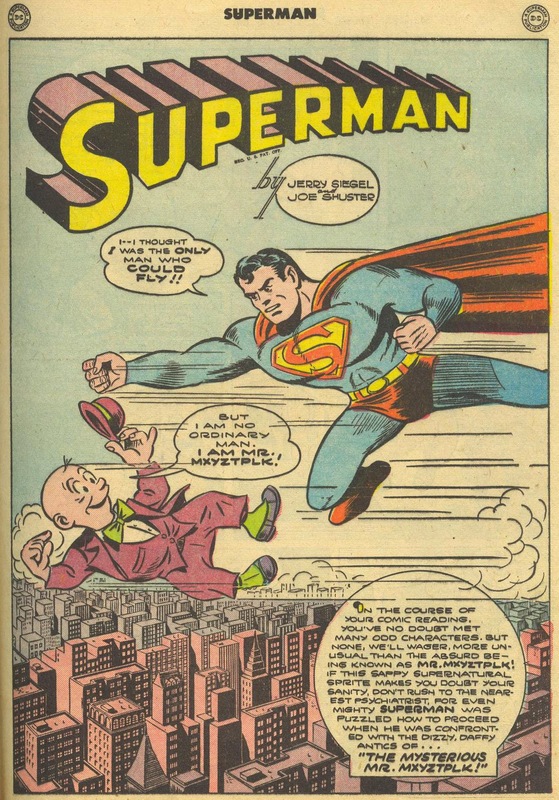 Episode #68: Happy Birthday, Mr. Mxyzptlk! The Mysterious Mr. Mxyztplk, the 4th story in Superman 30. Note the slight difference in the spelling of his name from his first appearance compared to his modern incarnation. SUPERMAN 30: THE GREATEST SUPERMAN STORIES EVER TOLD (1987) and vol. II of the current edition. SUPERMAN 33: No reprint information available. SUPERMAN 40: SUPERMAN IN THE FORTIES trade paperback. SUPERMAN'S PAL JIMMY OLSEN 52: no current reprint edition, reprinted in SPJO 122, Aug./Sept. 1969 issue. ACTION COMICS 273: SHOWCASE PRESENTS: SUPERMAN VOL. II. SUPERBOY 83: no reprint information available. ADVENTURE COMICS 310: SHOWCASE PRESENTS: LEGION OF SUPER-HEROES VOL. I. ADVENTURE COMICS 355: LEGION OF SUPER-HEROES VOL. VI. SUPERMAN #349: no reprint information available, but the web site http://www.tgfa.org/comics/superman/superman.htm has the entire story available to read on line. ACTION COMICS 583: WHATEVER HAPPENED TO THE MAN OF TOMORROW?, trade paperback out of print, hardcover edition available July 8, 2009. (I said June 2009 in this episode.) Go to http://dccomics.com/dcu/graphic_novels or http://collectedcomicslibrary.com blog and podcast for more information. This story is also reprinted in the trade paperback DC Universe: The Stories Of Alan Moore. SUPERMAN 11: the out of print trade paperback LOIS & CLARK: THE NEW ADVENTURES OF SUPERMAN. SUPERMAN 31: No reprint information available. ADVENTURES OF SUPERMAN 463: SUPERMAN VS. THE FLASH trade paperback, with an Alex Ross cover. SUPERMAN 49, ADVENTURES OF SUPERMAN 472, STARMAN 28, ACTION COMICS 659 and SUPERMAN 50: reprinted in the out of print trade paperback KRISIS OF THE KRIMSON KRYPTONITE. SUPERMAN 75: No reprint information available. SUPERMAN 160 & 161, ADVENTURES OF SUPERMAN 582 & 583, SUPERMAN: MAN OF STEEL 104 & 105, ACTION COMICS 769 & 770 and EMPEROR JOKER 1: reprinted in the EMPEROR JOKER trade paperback. ADVENTURES OF SUPERMAN 638: the trade paperback Superman: Ruin Revealed. ACTION COMICS ANNUAL 10: No reprint information available. COUNTDOWN 31 & 23: the trade paperbacks COUNTDOWN VOL. II & VOL. III respectively. ALL-STAR SUPERMAN 6: ALL-STAR SUPERMAN VOL. I hardcover and trade paperback. I called in to episode 509 of FANBOY RADIO, broadcast live on Sunday, April 19, 2009 at 7:00 p. m. The host Scott Hinze interviewed David Weber, the author of my favorite SF novel series Honor Harrington. I called the show around the 45 minute mark and asked about any movie or TV options on the series. To learn more about the Honor Harrington series, you might enjoy this interview with the author. As of this posting this episode was not yet available, but check back in a few days at http://fanboyradio.com , or on Fanboy Radio's podcast feed on iTunes. Next episode: The second prequel to our spotlight on the 1990's SUPERMAN IN EXILE storyline: SUPERMAN GOES GANGBUSTERS! Episode #67 Part II: April Fools, Bizarro! Man Of Steel (vol. I) 5 & All-Star Superman 7! Download Episode 67 Part II! MAN OF STEEL 5: THE MIRROR CRACK'D, reprinted in the MAN OF STEEL tpb. BIZARRO WORLD storyline in SUPERMAN 87, ADVENTURES OF SUPERMAN 510, ACTION COMICS 697, SUPERMAN: THE MAN OF STEEL 32 and SUPERMAN 88, reprinted in the BIZARRO'S WORLD tpb, now out of print. EMPEROR JOKER storyline in SUPERMAN 160-161, ADVENTURES OF SUPERMAN 582-583, SUPERMAN: THE MAN OF STEEL 104-105, ACTION COMICS 769-770 and SUPERMAN: EMPEROR JOKER 1, reprinted in the SUPERMAN: EMPEROR JOKER tpb. ACTION COMICS 855-857, collected in the Escape From BIZARRO WORLD tpb/hc. SUPERMAN 682 and 684 currently not collected because the New Krypton storyline was ongoing at the time this episode was posted. ALL-STAR SUPERMAN 4, reprinted in ALL-STAR SUPERMAN VOL. I tpb/hc, and ALL-STAR SUPERMAN 7 and 8 reprinted in ALL-STAR SUPERMAN VOL. II hc. If you have not read some or any of these stories, read them first and enjoy them for yourself, then return to this episode. MY PULL LIST is my spoiler free comic book review blog of the titles I read every week. It can be found at http://mypulllist.blogspot.com . Send e-mail about this blog to mypulllist@gmail.com. Show art is from the cover of ACTION COMICS 857. Use of the cover art is not intended as a violation of the copyright of DC Comics, but is done in the interest of documenting and reviewing a piece of comic book pop culture. Episode #67 Part I: April Fool's, Bizarro! 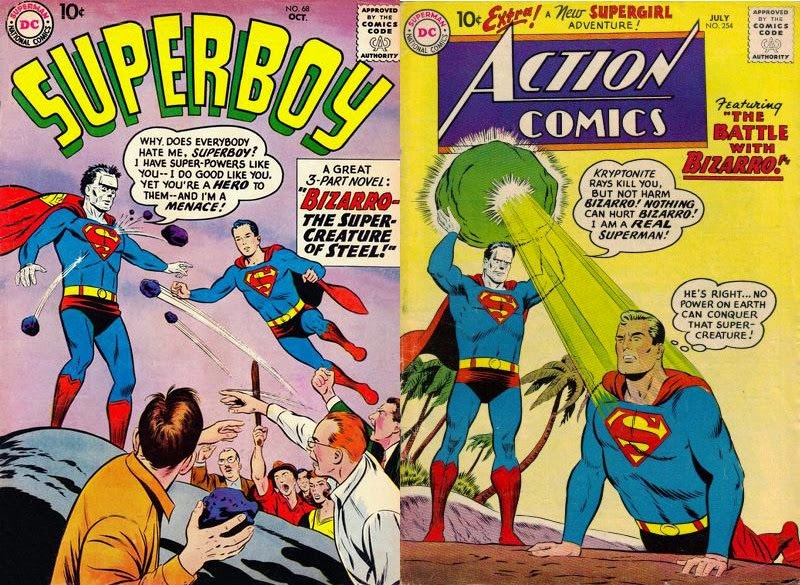 Superboy 68 & Action Comics 254, the first appearances of Bizarro! Download Episode 67 Part I! Bizarro is the perfect character for the April Fool's Day episode. Part I explores the silver age Bizarro in the following stories, with their reprint information provided. If you haven't read some or any of these stories, search for the reprint editions and enjoy the stories for yourselves first. Then come back and listen to this episode. ACTION COMICS 254: THE BATTLE WITH BIZARRO and ACTION COMICS 255: THE BRIDE OF BIZARRO, reprinted in SUPERMAN IN THE FIFTIES tpb and SHOWCASE PRESENTS: SUPERMAN VOL. I tpb. ACTION COMICS 263 : THE WORLD OF BIZARROS and ACTION COMICS 264: THE SUPERMAN BIZARRO, reprinted in SHOWCASE PRESENTS: SUPERMAN VOL. 's I & II tpb. SUPERMAN 140: THE SON OF BIZARRO, reprinted in SHOWCASE PRESENTS: SUPERMAN VOL. II tpb, SHOWCASE PRESENTS: SUPERGIRL. I tpb, and SUPERMAN: ESCAPE FROM BIZARRO WORLD hc. SUPERMAN 483: WHATEVER HAPPENED TO THE MAN OF TOMORROW? Part I, reprinted on WHATEVER HAPPENED TO THE MAN OF TOMORROW? tpb (out of print) and HC (scheduled to be published July 8, 2009) and DC UNIVERSE: THE STORIES OF ALAN MOORE tpb. Show art is from the cover of SUPERMAN 202. Use of the cover is not intended as a violation of the copyright of DC Comics, but is done in the interest of documenting and reviewing a piece of comic book pop culture.